My environment included 2 sites and I had to run most of the steps below per site. I found that it was best to install CU4 on both sites before continuing In fact since the sites share a CMS its not a good idea to push ahead with one site and leave the other behind. Another Gotcha was that the TMG on the site where my test user was, was faulty. Make sure the user you test with is homed to the same site as the TMG you are testing through. Also found that most PS commands were best run from the FE holding the CMS. I have also configured the external discovery record, which can be verified using mxtoolbox.com. This is pointed toward the external listener address of each site’s TMG reverse proxy. Run “net start w3svc” after the install. Once this is complete the MCX internal ports need to be defined via the Lync management shell. #ONLY USE IF YOU WANT TO RESTRICT TO INTERNAL ONLY!! The next step is to install MCX server components, ie the mcxstandalone.msi. Before you can run the installation a few changes need to be made to IIS. 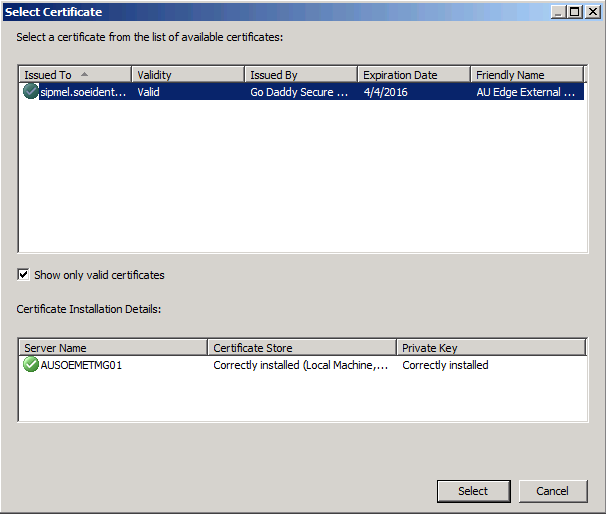 Update the internal SAN certificate, this needs to include the newly created lyncdiscoverinternal. This will return all certificates and their corresponding thumbprints. There are two approaches here, one uses SSL for setup the other does not. The main reason for allowing a re-direction from port 80 (http) to 443 (https) is to avoid the need of replacing your existing SAN. 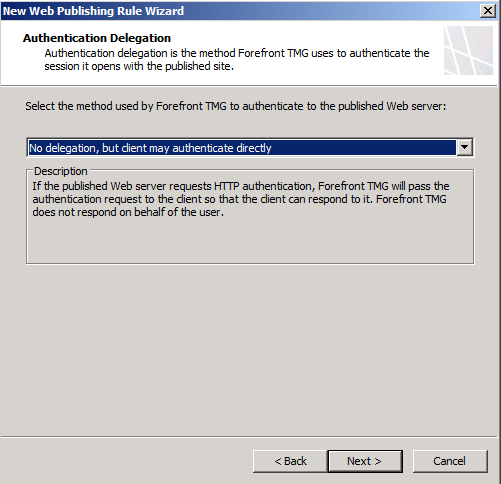 The recommended approach is to only permit the Lync mobility client to communicate on port 443, so I replaced the certificate within my existing Lync web listener within Forefront TMG. 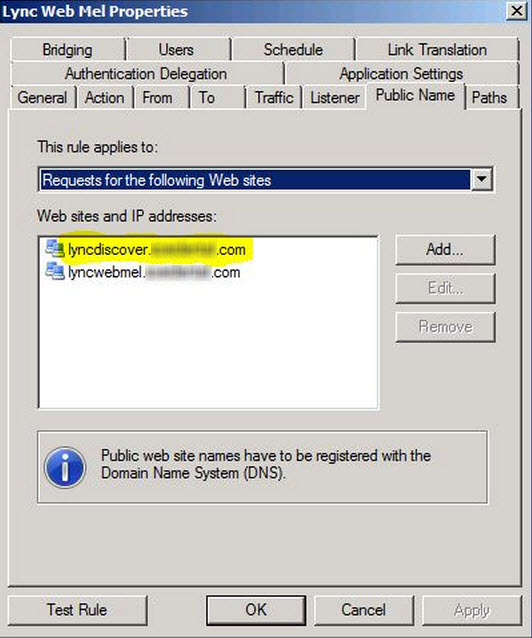 Since the existing Web Listener rule already defines the port forwarding and includes the Cert the logical approach is to simply add the new URL lyncdiscover. to this rule and update the certificate accordingly. 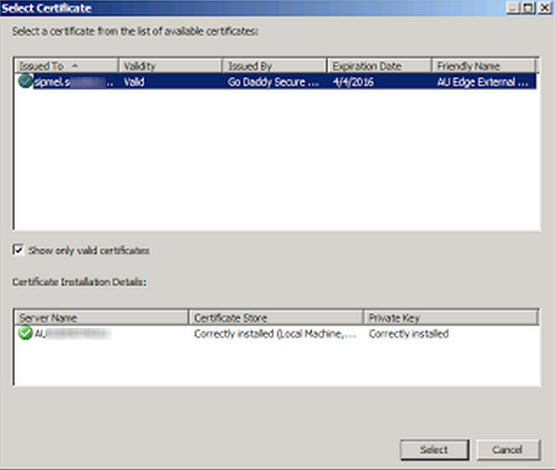 Associate the updated Certificate, remember only certs in the private store will be visible here. You will get a cert mismatch or 403 – Forbidden: Access is denied.